It always seems that as summer ends and the days begin to get shorter there’s the feeling that it’s time to get busy. And in the fall months there always seems to be no end to the possibilities – especially when it comes to conferences and events that bring the industry together to share ideas and build relationships. Later in this issue, we take a look back at one such event – Offshore Europe. Despite the lean times, this event in Aberdeen was upbeat, with a positive look towards the future. But before the OE review, we have a line up that that we’re sure you will find interesting. To start, we hear about subsea wet gas compression from OneSubsea – a global leader in subsea multiphase boosting, compression and metering – and how the OneSubsea Multiphase Compressor, the world’s first true subsea wet gas compressor, with no requirements for an upstream separation facility or an anti-surge system. From oilfield service company Archer, we hear how permanent plug and abandonment (PP&A) – a traditionally expensive task – can be performed more efficiently and cost-effectively by the use of the Archer Topaz, a modular drilling rig (MDR) designed to service the platform drilling industry. LKAB Minerals describes how 1,800 tonnes of MagnaDense, used as ballast for the Draugen Floating Platform (FLP) since 1993, was successfully retrieved and recycled – a decommissioning success. 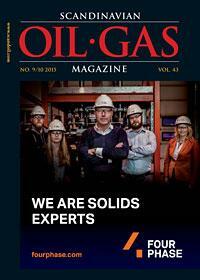 This issue has traditionally looked into HSE matters in the oil and gas industry. Safe operations as a mind-set permeate the industry – borrowing from the evolution of the Internet, a kind of positive “safety of things” ubiquity. Converting low grade carbon based materials into synthesis gas – gasification – produces an efficient fuel to generate steam or electricity, and AMETEK Land explains how process imaging using remote infrared technology can reduce maintenance and improve safety in the gasification process. One of the major challenges facing the oil and gas industry today is to ensure the safe operation of ageing assets. Inspection and maintenance contribute to this, and Hydratight’s hot bolting offering – termed MorSafe bolt renewal services – provides a safer solution to execute critical and potentially dangerous bolt change outs while the assets remain online. From AISUS Offshore, we get a look into how inspection technologies such as corrosion mapping and ultrasonic testing help contribute to safer operations. Oteac, which supplies inspection, service, testing and maintenance of the complete range of fire, safety and life-saving products and systems, describes how these evolving technologies have served to create a safer industry. SRO Solutions explains how big IT trends – the impact of mobile, the power of Big Data, the possibilities of the Internet of Things (IoT), the demands of interoperability – are providing opportunities for forward-thinking companies, including and the oil and gas sector. And there is more, including offshore accommodation quarters from Sodexo, modern labyrinth design bearing protection seals from AESSEAL and the Stanhope Seta FIJI FAME tester – to mention a few. As we progress though the fall months, we here at Scandinavian Oil-Gas Magazine will take up our final issue of the year. The issue looks back over this year and forward into 2016, so if you have any insight that you would like to share with our readers, please drop us a line. We look forward to hearing from you.